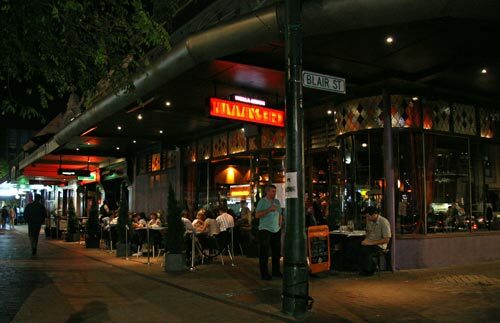 The reform of liquor laws in 1989 made it legal to open drinking establishments without accommodation attached. These bars in Courtenay Place, Wellington have indoor-outdoor flow – dining and drinking spill out onto the pavement, adding to the atmosphere of this district. It has changed from a retail and warehouse zone to a popular night-time entertainment spot replete with clubs, bars, cafes and restaurants.